Fronted by junior Jonathan Collins, the Massachusetts men’s track and field team took fifth place at the multi-day Atlantic 10 indoor track and field championship meet this weekend. Collins scored 5,214 points in the heptathlon, a multi-event that consists of shot put, the 60-meter dash, long jump, high jump, 60-meter hurdles, pole vault and the 1000-meter. After finishing the first day of the heptathlon events in second place, Collins returned on Sunday to take third place in the pole vault and 60-meter dash, and fourth in the 1,000-meter, securing his first-place finish. He was followed by Hunter Gray, who claimed third with 4,512 points. They were two of four UMass medalists at the meet. On Saturday, senior John Chuma cleared 15 feet and 9 inches in the pole vault, earning third place in the process. Also scoring individually on the first day of competition were Noah Kortkamp (22 feet, 3.5 inches) and Hunter Gray (22 feet, 1.75 inches) in the long jump. The distance medley relay team of Russell Wells, Andrew Hanwell, Nicholas Santos and Brian Gendron placed sixth in 10:10.3. After qualifying for the 60-meter hurdle finals on Saturday, junior Jake DeGrace returned the following day to secure second place in 8.18 seconds, claiming the Minutemen’s fourth and final medal of the meet. Sunday also featured junior Nathan Adeyemi placing fifth in the triple jump (44 feet) and junior Cole Acoveno placing seventh in the high jump (6 feet, 4.25 inches). 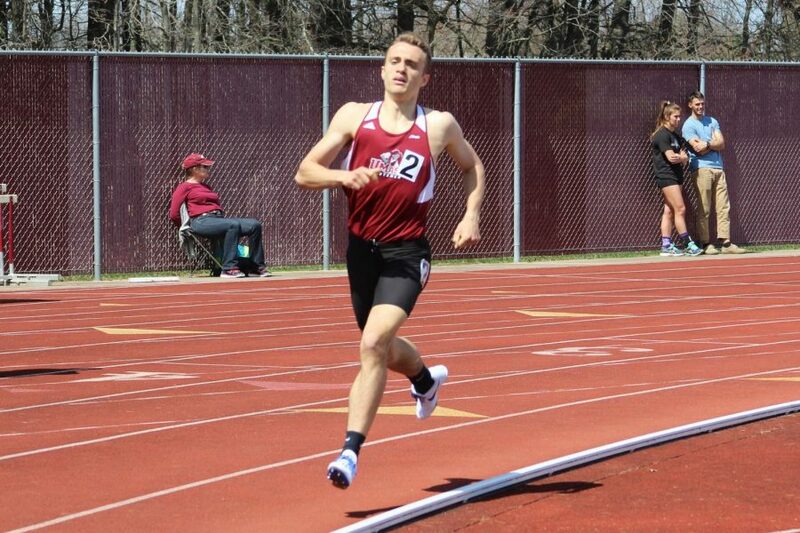 In distance events, sophomore Dawson Bathgate took sixth in the 3,000 meters (8:29) while junior Brian Gendron finished in seventh in the mile (4:16). Finishing out the day was the 4×800 meter relay team of Russell Wells, Zabih Kotecha, Brian Gendron and Nicholas Santos, taking fourth with a time of 7:50. Similar to the men, the Minutewomen were led by a strong performance in the multi-events, where redshirt junior Bridget Deveau won the pentathlon with 3,760 points. Despite trailing early, Deveau claimed first in the shot put, long jump and 800-meter sections of the event to pull ahead. She was followed by senior Julia Witt, who took seventh with 3,269 points. Also on Saturday, freshman Danielle Notarfrancesco took seventh in the weight throw (53 feet, 3.5 inches), senior Kayla Rorke took seventh in the pole vault (11 feet, 5.75 inches), and junior Charlotte Robison (17 feet, 18.25 inches) and Deveau (17 feet, 8 inches) placed sixth and seventh in the long jump. On Sunday, the Minutewomen returned to take two podium finishes in the high jump with sophomores Jada Harris and Samantha Thompson, both jumping 5 feet, 8 inches, taking second and third. Also taking second and third were Notarfrancesco (49 feet, 0.25 inches) and freshman Lauren LaDere (45 feet, 3 inches) in the shot put. Notarfrancesco’s mark reset her own school record. Also medaling was freshman Ivana Nyemeck’s third place in the triple jump at 39 feet, 6.5 inches. Rounding out scoring for UMass was freshman Bryanna Rivers in the 800-meter (fourth, 2:14) and sophomore Lindsay Witt, who took seventh in both the 400-meter (57.68) and 200-meter (25.22). The Minutewomen placed sixth in the meet with 71.5 points, while VCU took home the trophy with 122.5 points. On the men’s side, UMass took fifth with 56.5 points. URI won with 204 points. UMass will return on March 3 and 4 at the IC4A Championships and the ECAC Championships for the men and women, respectively. It will then turn its attention toward the NCAA Championships a week later, for those who qualify.